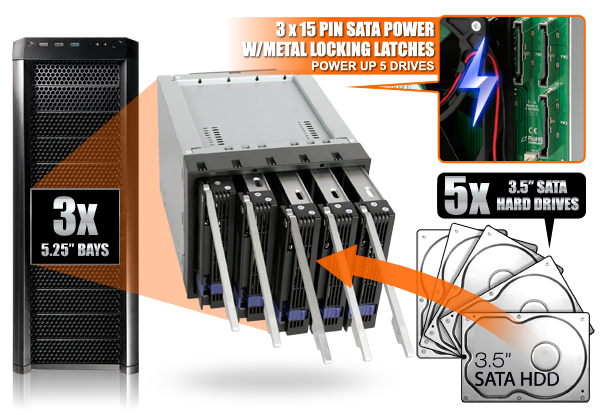 * Fits five 3.5” SATA I / II / III (SATA 6Gbps) hard drives in three 5.25” device bay & fully supports SATA Hot-Swap function. * Large 92mm cooling fan with full metal body for excellent heat dissipation for the most intense applications. * Interchangeable EZ-Tray tray design for internal drive security, exchangeability, expandability and maintenance capabilities. Compatible with DataCage Classic MB45X, ICYBento MB559 & ICYCube MB561 series. 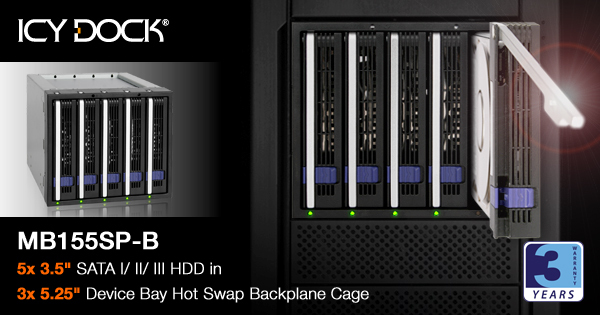 * Enhanced Direct Air Flow Design – Shuts off most vents while adding larger ventilation slots on the backplane PCB. * Active Power Technology (APT) - individual led & cooling fan only powers up if there is a drive installed in the bay. * Fully Modularized rear outtake cooling fan for easy maintenance or aftermarket replacement with 2 and 3 pin power ports available.